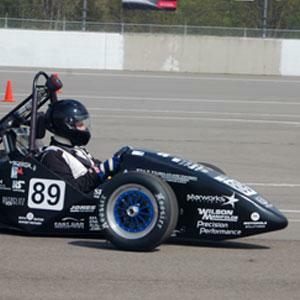 Florida Atlantic University’s Society of Automotive Engineers (SAE) racing team recently ranked eighth in the acceleration test among more than 100 participants at the 2013 Formula SAE®, at the Michigan International Speedway in Brooklyn, Mich. The acceleration event evaluates the vehicle’s demonstrated acceleration capability by measuring the elapsed time required for the vehicle to travel a distance of 246 feet from a standing start. This event focuses on engine performance and the suspension’s ability to maximize tire grip. The team came in eighth place with a time of 4.1 seconds. Teams are judged on design, cost, presentation, acceleration, endurance, fuel economy, skid pad, autocross, innovative design concepts, brakes and noise, powertrain development and three view drawing. The eight-person team, made up of interdisciplinary students in the College of Engineering and Computer Science, included Cusano, John Palmbach, Daniel Barak, Sitki Sipahioglu, Christian Caracci, Tim Bambu, Andrew Goodwin and Jonathan Taylor. The team also was aided by team advisor, Oren Masory, Ph.D., professor of mechanical engineering at FAU, and Fred Knapp, machinist at FAU. The Formula SAE is a student design competition, organized by SAE International, for student members to conceive, design, fabricate and compete with small formula-style race cars. The concept behind the race is that a fictional manufacturing company wants a design team to develop a small formula-style race car which will be tested for its potential use in their production line. The restrictions on the car frame and engine are limited so that the knowledge, creativity and imagination of the students are challenged. The cars are built over a period of one year and are taken to the annual competition for judging and comparison with approximately 120 other vehicles from colleges and universities throughout the world. The competition included teams from the United States, Austria, Brazil, Canada, Estonia, Germany, Mexico, Singapore, South Korea and Venezuela. For more information, contact Oren Masory, Ph.D., at 561-297-3424 or masoryo@fau.edu.